Cotton Walkin' Thru the Park!!! In 1977 the Muddy Waters/Johnny Winter/James Cotton LP Hard Again came out without the tune, Walkin' Thru the Park. But it's an outtake you can get your hands on these days on most reissues of Hard Again or the Blue Sky box set. And what do you hear when you listen to it? Perhaps a little less harp under and behind Muddy than in the earlier days. That quarter note triplet bar that the bass and drums plug in at chord changes so common starting in the 70s or 80s - you did not hear that in earlier blues. Cotton's unmistakeably intense, powerful, rage-filled playing. His solo emphasizes (or uses as a "focus note") the flat seventh and also relies on mostly inhale notes. And rhythm man RickEy pointed out the interesting thing Cotton has going in his solo rhythmically - bar 1 reprises the rhythm of the cha cha intro; bar 2 is the same notes in quarter note triplets; and bar 5 hits the same notes again, this time in the shuffle. Cool walk through the rhythmic choices available to him! 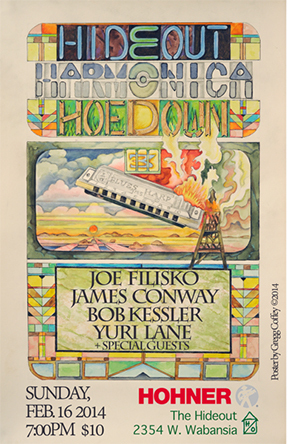 The third annual Harmonica Hoedown makes its return to the Hideout on February 16, featuring Joe Filisko, James Conway, Bob Kessler and Yuri Lane. Get your tickets now! The University of Chicago Press is offering I Feel So Good: The Life and Times of Big Bill Broonzy as a free e-book during the month of February. The 2011 book was written by Bob Riesman with a foreward by Peter Guralnick and an Appreciation by Pete Townshend.